Some people have trouble using a long shoehorn for various reasons, due to the size of their calf or a shoulder injury, or whatever. Put shoes on without using your hands or a shoe horn. 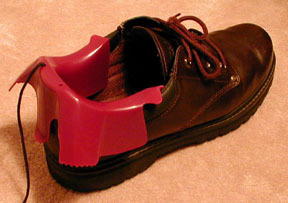 Put a FootFunnel™ into your shoe and eliminate obstacles to foot entry that a shoe horn creates for some people. Great for those that have trouble reaching down with their hands. Removes from shoe once you have put it on. Works with most shoe and sneaker types and sizes. Made in USA.